Randall's Adventure Training has been designing, marketing, and selling survival and military-style knives since their first survival courses in the Amazon Jungle of Peru. The Ontario RAT Model 2 from Randall's Adventure Training is a scaled down of the wildly popular RAT-1. It's another folding EDC knife that can withstand hard use and abuse associated with hunting or survival tasks. For the money, there might not be a better knife on the market that can match the performance of Ontario Knife Company’s RAT Model 2. It features an ergonomic handle with smooth action and rock-solid lockup. The four-position pocket clip allows the user to customize their carry method to their liking. If you are looking to add a new knife to your EDC rotation (or you think it would make a great fit for a survivalist, hunter, backpacker, or friend), rest assured you're making the right choice when you go with an Ontario RAT Model 2. 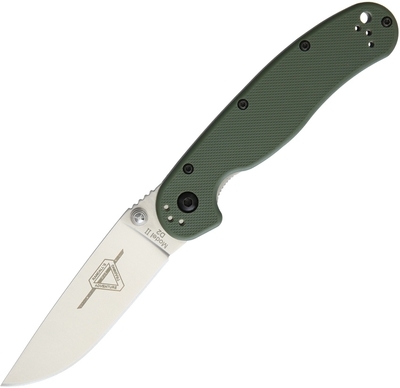 This RAT 2 features a tough blade made from D2, an air hardened tool steel with high wear and abrasion resistant properties. Other specifications are: Length - 4" when closed. Blade length - 3". Blade steel - D2 tool steel. Blade style - drop point blade. OD Green G10 handle. Thumb stud. Pocket clip. Lanyard hole.